Let’s thank all donors this National Donor Day – a day designated to raise awareness for organ, eye, tissue, marrow, platelet and blood donation. Today is about giving to those in need, so learn more about Mayo Clinic’s Living Donor Program. Also, consider other options such as checking the Organ Donor box or joining the Be The Match Registry®. 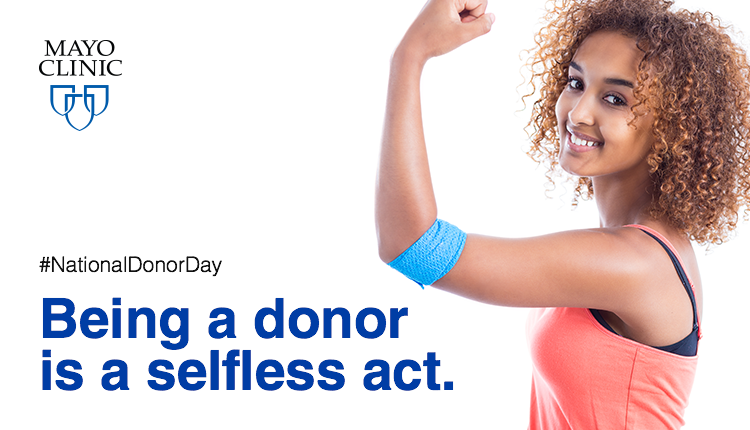 Let’s thank all donors this National Donor Day – a day designated to raise awareness for organ, eye, tissue, marrow, platelet and blood donation.